Bosnia and Herzegovina, Serbia, Montenegro, Macedonia, Kosovo and Romania all plan new lignite power plants during the next few years. In contrast, most EU countries are giving up building new coal plants and seven EU states are already coal-free.1 The Balkan coal plans starkly conflict with the Paris Agreement's aim of limiting climate change to 1.5 degrees celsius. 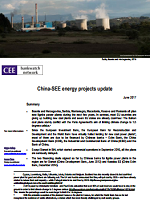 Since the European Investment Bank, the European Bank for Reconstruction and Development and the World Bank have virtually halted lending for new coal power plants most of them are due to be financed by Chinese banks – ExIm Bank, the China Development Bank (CDB), the Industrial and Commercial Bank of China (ICBC) and the Bank of China.